While I'm not loving the slushy mess outside that is our current snow situation, I am completely and totally fascinated with snowflakes. I love seeing them float lazily down from the sky and land on my car - a perfect six-sided figure of little more than ice. The symmetry and elegance is unparalleled. 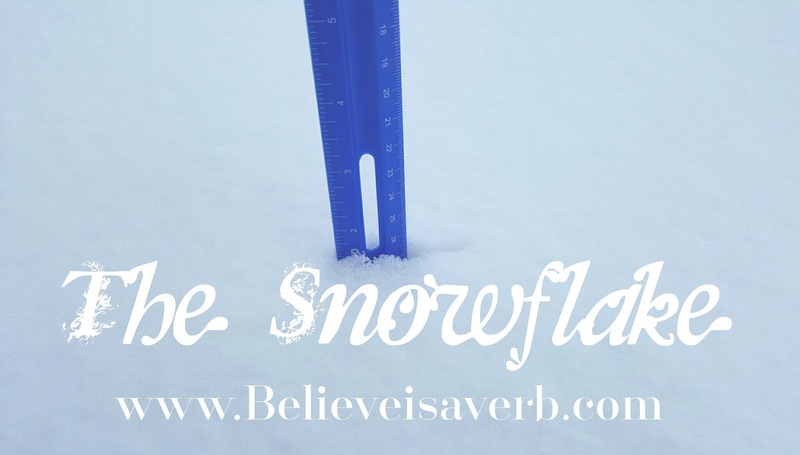 Due to natural forces I don't fully understand, every snowflake forms in much the same way. Just as snowflakes all originate in the same manner, so do we. Each of us was created by a loving Heavenly Father who loves us and wants to see us become like Him. He has given us the same beginning, the same central core - a spirit capable of learning and growth. When we pass through the veil, we gain a body. As we grow and take slightly different paths through life, we take on different appearances. No matter what our shape - physical or spiritual - we are beautiful, graceful, elegant beings. We are children of a King. All we must do is believe. I am a cautious driver. I ease out of parking spots, slow down at intersections, and rarely go more than five over the speed limit. When pulling out into traffic, I tend to wait until there's a considerable gap so I don't inconvenience oncoming traffic too much. As a result of my caution, I've never gotten a ticket of any kind. (Although, if you ask my husband, it's because I'm a girl.) Twenty years since I got my license and I still have a clean driving record. Not too shabby. My caution, however, is often dependent on environmental factors. When the weather is bad, I drive slower than necessary, take longer to turn, and start stopping way before the traffic light. Heavy rain, snow, ice, and even occasionally night driving will turn me into the world's most cautious driver. When I'm the only one on the road, I do exactly what I feel comfortable doing. Which usually means I'm obeying traffic laws. I'm fairly predictable like that. But there are times when I'm waiting to exit a parking lot and the line of cars is building behind me and the oncoming traffic doesn't give me the size break I want and the pressure mounts... (I hate being honked at, by the way) ...and I take a risk I don't usually take and I jet out into traffic and my heart races and I absolutely hate driving and I second guess my timing for the next two miles or more, hoping I didn't offend anyone. This is why I try to turn right or use a protected left-hand turn whenever possible. And why I like living far enough out in the suburbs, we fight farmers on tractors for the right of way. In a way, my cautious (and occasionally reckless) driving is much like life in general. For the most part, I'm conservative and tend to follow the rules. I rarely step out of line and I try to live my life as God would have me do. But there are times when pressure mounts and people are watching and there are expectations and deadlines are encroaching and children are yelling and things are breaking and my mind spins and I can't think straight and suddenly I'm yelling or doing something stupid or inconsiderate and I absolutely hate dealing with people and I second guess my actions for the next two weeks or more, hoping I didn't offend anyone. At times like that, I have to remind myself to slow down. And listen. Not just to what my whiny child is really trying to tell me, but what my Heavenly Father wants me to hear. For with Him at my side, I don't have to be afraid of being myself. I don't have to worry about what others think or the pressures of this world. For the only thing that truly matters is what He thinks of me. Despite my near-constant complaints about the cold, I truly do love when it snows. I love how it sparkles in the sunlight and watching fat snowflakes fall to the ground. I love how it sticks to my hair as I walk through a light flurry and it brightens the day. I also love how it blankets the ground, hiding imperfections and creating a flawless landscape. Especially since we haven't had the opportunity to finish our lawn. The snow covers our weedy flowerbeds and conceals the patchy nature of our still-maturing grass and I can pretend our yard is just as picture-perfect as the rest of my neighborhood. After some time, however, the beauty of the snow diminishes. It grows dirty and slushy as the cars drive through it. Footprints mar the pristine surface and as it melts, everything turns muddy. Things that were once hidden are now open for all to see. What was once a winter wonderland turns into a mucky mess. So it is with us. When we neglect to do the things God has asked of us, our spiritual landscape becomes full of weed-infested flowerbeds and patchy lawns with toys strewn about haphazardly. We can blanket what we don't wish to see and ignore what was once plain to be seen, pretend it doesn't exist. 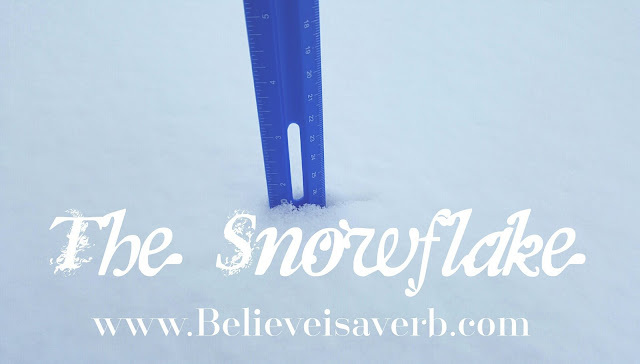 But just as the snow can't last forever, neither can our deliberate avoidance of the truth. Just as I must get my flowerbeds planted and nurture my poor lawn to full health, so must we plant seeds of faith and nurture our testimonies to full health. The deception of false perfection, while beautiful to behold, is always temporary. We must take care to always work to become better, truly better - at the core where it matters most. For nothing hides forever. Not even beneath the snow. I have a confession to make - I have a black thumb. Not an actual black thumb. (That could be quite painful!) As my husband says, I'm a serial killer of plants. I've managed to kill every kind of plant there is - ivy, cacti, hostas... It's so bad that when someone gifted me a poinsettia this last Christmas, my 14yo son banned me from watering it. He's taken over caring for it and, for whatever reason, it still looks as good as the day I brought it home. He obviously did not inherit my [lack of] gardening skills. Despite my horrible luck with anything of the leafy variety, my husband and I are planning on starting seeds for our garden this year. This has the potential to be a catastrophe. I'm already pitying the poor plants that will manage to sprout under my care. However, I'm determined to change my blacker-than-night thumb to something less deadly. Maybe a pale brown? Anything would be better than what I have. So I'm doing a boatload of research on every aspect of the gardening process - pre-sprouting seeds, indoor greenhouses out of salad containers, watering methods, transplanting and thinning guidelines, and more. This year, I'm going to make it work. My basil plants will be big and beautiful. My tomatoes red and luscious. And my columbines will be absolutely gorgeous. It's going to happen, gosh darn it! Just as my gardening success will require meticulous research and careful preparation, we need to do the same for our faith and testimonies. Faith is often compared to a seed, one that will grow only with proper care and attention. If we remain lax in our studies and fail to feed and water that seed of faith, it will not grow and can eventually die. 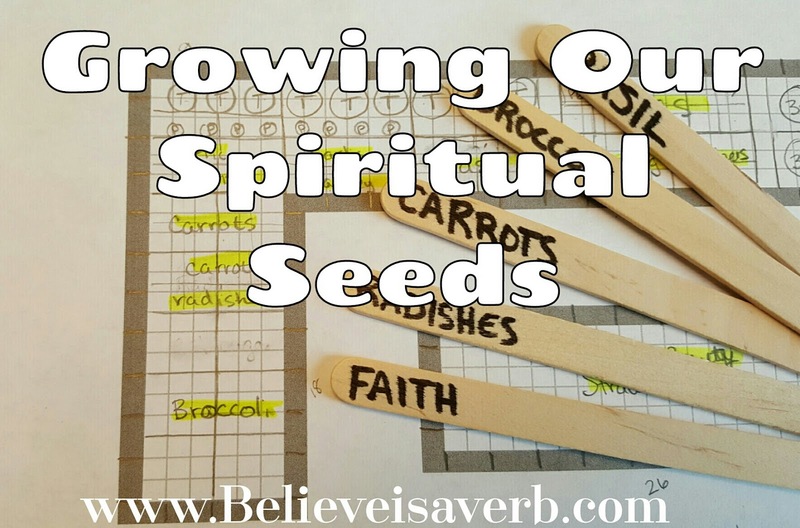 How can we feed our spiritual seeds? Prayer and study of the words of the prophets - both in the scriptures and our modern-day seers and revelators - are as sunlight and water to our seedling of faith. We nourish our growing plants by partaking of the sacrament each Sunday and by attending our Sabbath day meetings. Our plants gain additional nutrients as we serve one another and care for those less fortunate or who are struggling. There are many ways to help our spiritual seeds to grow. As long as we seek to continually improve ourselves and follow God's commandments, our faith will not only grow, it will flourish. 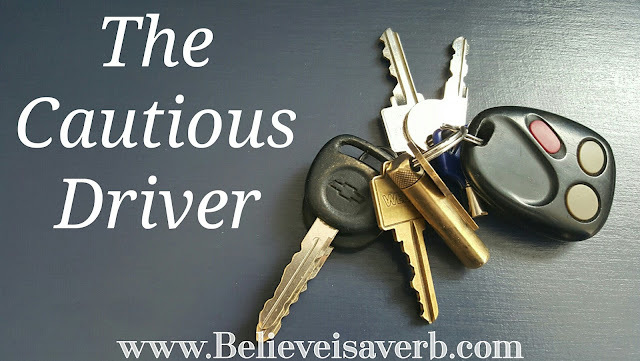 Believe is a verb. A verb is an actions. Therefore, to believe is to ACT. I love the week following Christmas. The days are lazy, the kids are busy playing with their new toys and games,and time seems to slow. We have almost nowhere we need to be and very few obligations to meet. With so much relative freedom, I find it easy to center my thoughts and decide how best to approach the new year. It's a fresh start, a chance to begin again. I can set goals and make resolutions to improve myself. The possibilities are endless. Finish writing my current work-in-progress. Submit to agents and hopefully get published. I know I may not succeed in all my new endeavors, but I find myself better for the attempt even if I fail the very next day. On a more spiritual scale, we are privileged to experience a similar renewal every week as we honor the Sabbath day and keep it holy. As we remove the worldly distractions, we're able to relax and enjoy each others' company. Time seems to slow. It becomes easy to center our thoughts on Christ and decide how we'll approach a new week. It's a fresh start, a chance to begin again. We can set goals to improve our spiritual nature. The possibilities are endless. We may not succeed in all our endeavors, but we will find ourselves better for the attempt even if we fail the very next day. 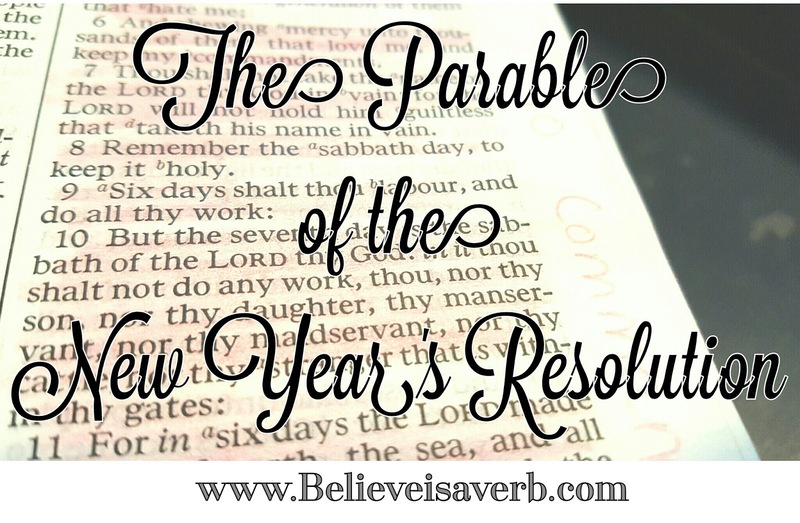 As with New Year's resolutions, our weekly resolutions to become more like Christ can be a chance to begin again. Failure is only a temporary state, for we know we have more opportunities to try. So this Sunday, and every Sunday afterwards, let us take advantage of this special day that has been set aside for our spiritual benefit. This morning, for whatever reason, the poem "The Road Not Taken" by Robert Frost filled my mind and wouldn't let go until I read through it again. I first read and memorized it back in middle school for a school assignment. Even then, the meaning behind the words resonated deep within. I've often taken the road less traveled. My choices have yielded both bad and good consequences. For the most part, I have few regrets. We're often confronted with choices in life. 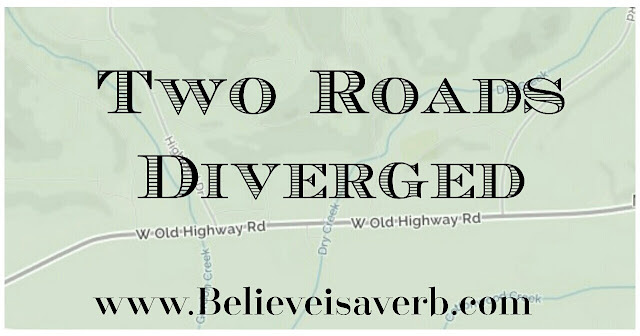 Some seem as similar as the two roads described in the poem, with very little to distinguish them other than a fair bit of grass. Other times, the roads are as different as night and day. There are times the poor road - filled with potholes and detours - is obvious. And other times, it looks just like the good road. As we follow Christ and listen to the promptings of the Holy Spirit, signposts are clear to see and our choices are made easy. They are like a spiritual GPS in the road of life, helping us to our final destination. When we choose to ignore the signs provided, we often find ourselves in dark and dreary places, far from home. However, we can choose to change our direction once again and make our way back to our preferred route. Forgiveness is simply finding a new path. Be careful in your choices. Look for the signposts and seek for the paths that will lead you back to our Heavenly Father. For the road we take truly makes a difference. Last Friday, I dressed up like an elf for an assembly at my son's school. I took extra pains to curl my hair, wear extra makeup, and dress in clothing appropriate for one of Santa's elves. It was all so the kids I saw almost every single day during traffic control wouldn't recognize me. I also relied on the fact I wasn't wearing my bright orange vest with "Miss Melissa" on the back to aid in my deception. During the performance, where I recited "A Visit From St. Nicholas" and read "The True Story of Santa Claus", the kids were riveted, more focused on the words than me. But when I visited each classroom to deliver treats, a few of the children started to call me out. "I know who you are," a little girl said with a sly grin. I waved her away with a quiet shush, not wanting to ruin it for the other kids. "Hey, I know you!" a little boy cried out. I ignored him and jingled my way out of the classroom (my shoes and mittens had jingle bells). The longer I stayed, the more children began to recognize me for who I truly was. The crowning moment was when I stayed to help with traffic control in the afternoon - still decked out in elfish attire. The excited children swarmed me and peppered me with questions. When was Santa coming to pick me up? What time was I going back to the North Pole? 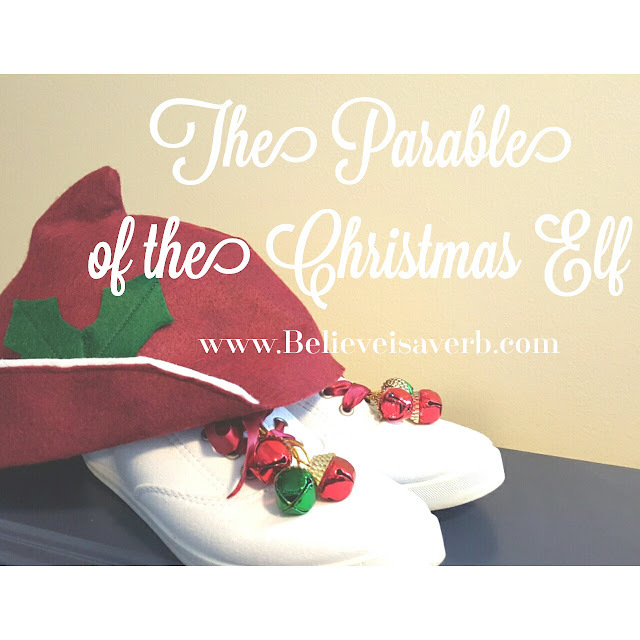 "Wait," an older boy said, peering under my elf hat. "I recognize you! You're Miss Melissa!" Nothing I said or did could persuade him otherwise. Nor would he stop announcing it for all to hear. I was found out and outed. Not all the glitter and sparkles in the world could hide who I really was. In life, we often put on disguises for others to see - masquerading as something we're not to fool people we want to impress. Perhaps we're hoping to be seen as 'cooler' than we are. Or smarter. Or more trendy. No matter what we do, these disguises won't last. First one person will see through your carefully crafted mask. Then another. And another. Eventually, you, too, will be outed and shown for who you really are. Christ never pretended to be something He wasn't. He came to earth a newborn babe in the lowliest of circumstances. Many saw Him merely as the son of a carpenter from Nazareth. But those who looked, who truly saw Him for who He was, knew Him to be the Only Begotten Son of the Most High. His glory shall reign forever! So this Christmas season, remember who you are. You are a son or daughter of God, sent to earth to become something great and amazing. To follow in Christ's footsteps and gain eternal glory.